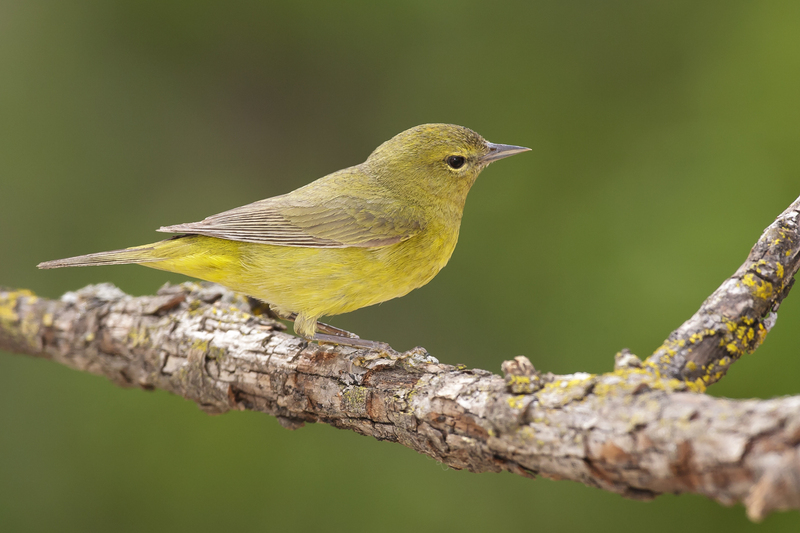 The wood-warblers, as a group, are among our most colorful and strikingly patterned birds. But there are exceptions, and one of the most notable is the Orange-crowned Warbler. 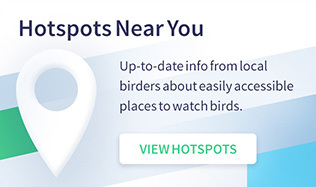 It’s a widespread bird that can be found practically everywhere in North America at some seasons, but its plain appearance makes it easy to overlook. The breeding range extends from western Alaska to Quebec and Labrador, south in the western mountains to New Mexico and Arizona, and south along the Pacific Coast through California. It winters mainly in the southern U.S. and Mexico, with a few south to Guatemala. In many areas of the southern states, it’s the second or third most likely warbler to be seen in midwinter. Orange-crowned Warblers are much less numerous in the east than in the west. Although they occur as migrants from coast to coast, east of the Mississippi they often elude birders in migration. This is partly because of timing: In the east, they tend to migrate earlier in spring and later in fall than most warblers. Even as far north as the Great Lakes, their fall migration is mainly in late September and October. They often forage low in brushy areas, even in stands of goldenrods, where birders might not be looking for warblers. Their lack of obvious field marks can also make them easy to overlook, espe​cially in fall, when many other warblers also wear relatively drab plumages. The species most likely to be confused with Orange-crown — Tennessee Warbler — is quite variable in fall. It usually has a fairly plain face with a pale eyebrow, or supercilium, a little more sharply defined than that of the Orange-crown. It is often dull yellow on the throat and chest, and it shows one or two very narrow pale wing bars. Its undertail coverts, usually white, are sometimes washed with yellow. However, it never has this area brighter yellow than the rest of the underparts. Orange-crowned Warblers vary in appearance by range. The drabbest olive-gray subspecies breeds across the north, from western Alaska to eastern Canada. In the mountains of the interior of western Canada and the western U.S., it’s replaced by another race that looks somewhat brighter. Along the Pacific Coast, from southern Alaska south through California, a fairly bright yellow subspecies takes over. Despite the variation in overall color, the same basic field marks apply everywhere, as illustrated and described in the accompanying photos and captions. 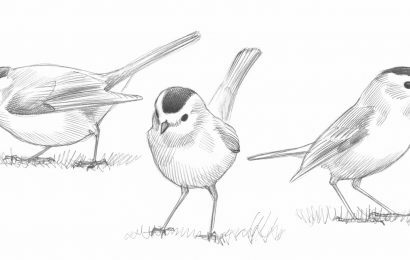 Oh, and as for its English name — males and most adult females do have a patch of orange feathers on the crown, but this patch is mostly concealed by the surrounding olive or gray feathers. You’re most likely to see it on adults in midsummer, when their feathers are worn, revealing the underlying color. It’s an intriguing thing to look for but not a useful ID point. Overall color and pattern. Grayish olive to yellowish olive (brighter in the far west), with few distinctive markings. Face pattern. Faint paler eyebrow and darker eyeline, with a more distinct but narrow broken eye-ring of whitish or yellow. Underparts. 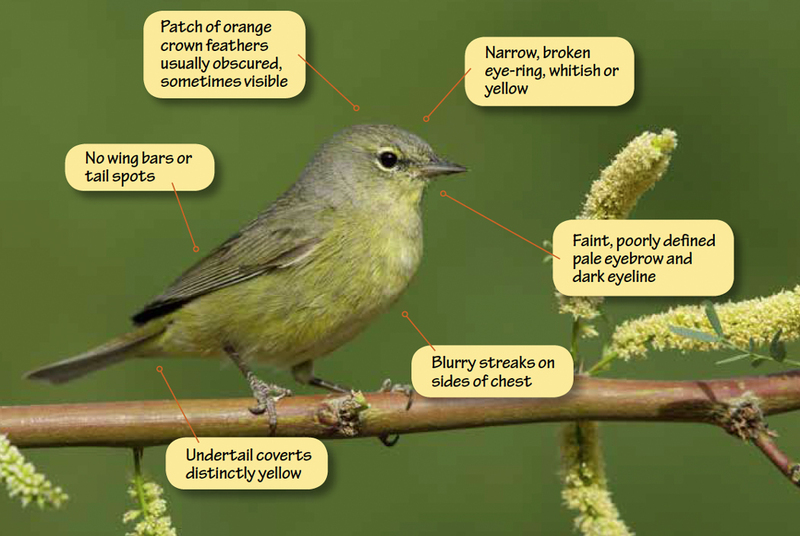 Overall dull to fairly bright yellowish olive, with blurry streaks at sides of chest (sometimes faint). Undertail coverts. Dull yellow to fairly bright yellow, always at least as bright as the rest of the underparts. Crown pattern. Adults have a patch of orange feathers, more extensive on males, but usually hidden by tips of other feathers. Like many other warblers, adult Orange-crowns from most populations go through a complete molt, replacing all the feathers, in late summer on the breeding grounds. In late winter, they have a limited molt, mainly replacing the feathers of the head. When the head feathers are in worn condition (in midsummer and sometimes in midwinter), the orange crown patch is more likely to be visible; a few orange feathers can be seen on this February bird wintering in southern Texas. Although this individual is near the dull and pale extreme for the species, its undertail coverts are still clearly yellowish, not white, and at least as bright as any other yellow on the bird. The underparts on Tennessee Warbler can range from bright white on spring birds to bright yellow on some in fall, but on the latter, the yellow is concentrated on the throat and chest. The undertail coverts are usually white. Sometimes they are tinged with pale yellow, but in those cases, they are much paler than the chest. The center of the back is noticeably green in all plumages, and the face always shows a fairly distinct dark eyeline and pale eyebrow; the bird in this photo is near the faint extreme. 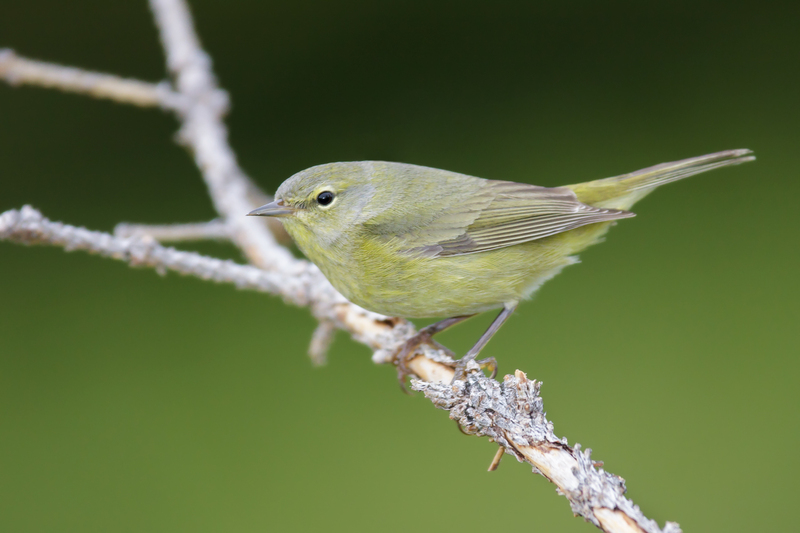 The shape of the bird is also helpful: Tennessee Warbler is distinctly shorter-tailed than Orange-crowned Warbler, and this is quite noticeable with some practice. The subspecies lutescens, averaging much brighter yellow than other populations of Orange-crowned Warblers, breeds in the Pacific Coast region from southern Alaska south through California. 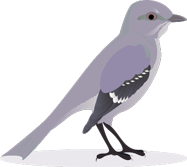 In migration it spreads farther east, appearing commonly in Arizona and straying as far as the Great Plains. Despite its brighter color, it resembles other subspecies in field marks. Its wings and tail are very plain, and its face pattern consists mostly of a narrow, broken eye-ring, typically yellow. The blurry streaks at the sides of its chest are often hard to see. Another subspecies, sordida, of the Channel Islands and locally on the coast in southern California, is similar but darker. It has heavier dark streaks below, including on the undertail coverts. 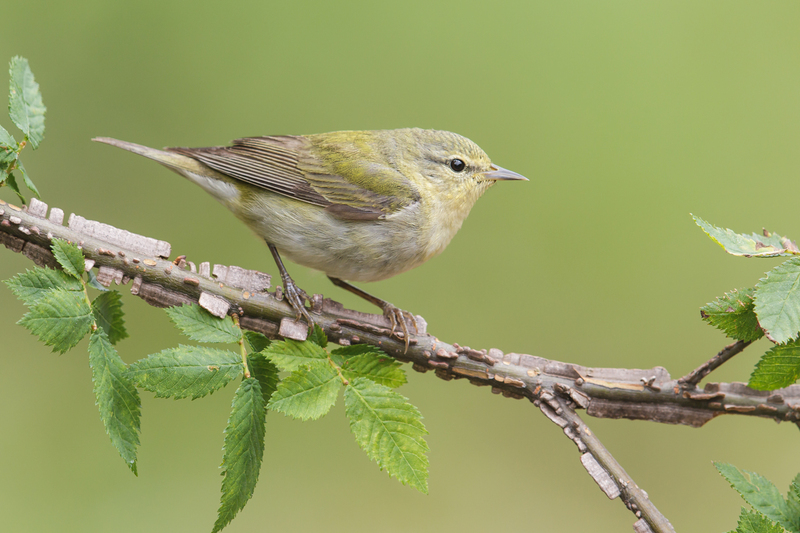 The brightest and drabbest subspecies of Orange-crowned Warblers both occur in Alaska. The widespread race celata breeds from far western Alaska all the way across Canada to the Atlantic shoreline in Labrador and Quebec. It’s the relatively dull olive-gray form like the one seen here. The bright yellowish lutescens is widespread in southeastern Alaska and extends north almost to the Anchorage area. This bird, photographed at Anchorage, looks typical of the drab eastern celata, but intermediate birds might be found nearby, and they might suggest the appearance of the race orestera from the mountain west. It’s tricky to try to apply subspecies names to birds in the field, but watching for such variations can add interest to birding travel. 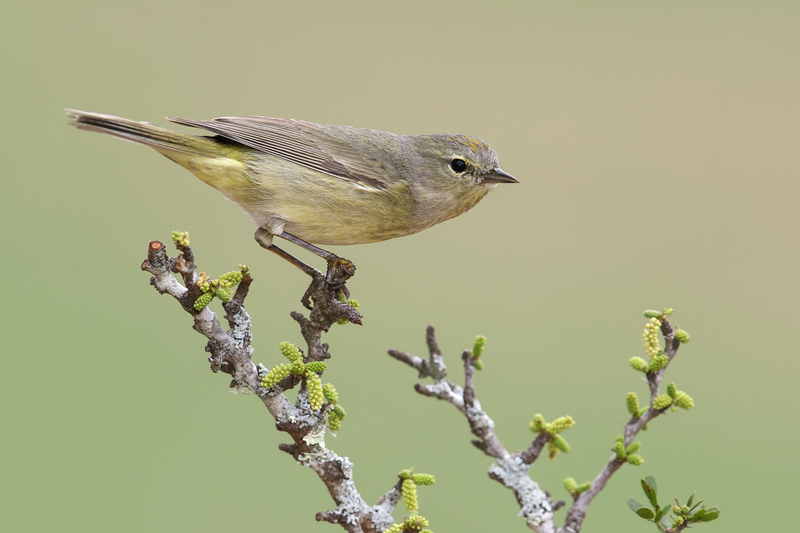 The amount of geographic variation in the Orange-crowned Warbler is not surprising for such a widespread bird. 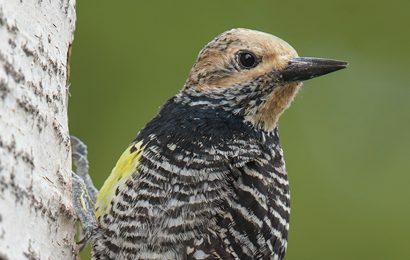 Briefly, the brightest yellow populations are found along the Pacific Coast, intermediate birds in the interior of the west, and the dullest olive-gray birds in the east and north. What’s interesting is that some other species show the same pattern of variation. Wilson’s Warbler is a particularly close parallel. The brightest populations are along the Pacific Coast, with a brilliant, almost orange-yellow on the head and chest. Those of the mountain west are not as brightly colored, while those breeding in eastern Canada are a duller, more greenish yellow. Other warblers also show yellow most strongly in the west. Among populations of Yellow-rumped Warblers, the western “Audubon’s” form has a yellow throat, while that of the eastern “Myrtle” form is white. The same phenomenon extends to species groups. Townsend’s Warbler and Black-throated Green Warbler are close relatives and look similar, but the western Townsend’s has much more yellow on the underparts than the eastern Black-throated Green. If we look for more examples, the pattern breaks down. The brightest yellow Palm Warblers, for example, are at the far eastern end of the breeding range, with those farther west looking much duller. 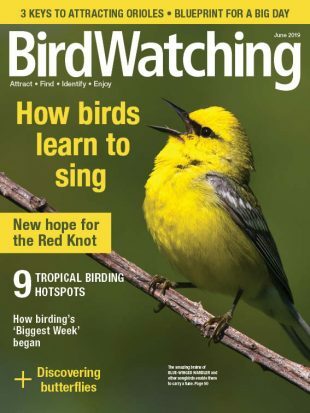 So, the parallels between Orange- crowned and Wilson’s Warblers may be no more than coincidence. But looking for patterns like this can help us to learn and appreciate more about variations in birds. 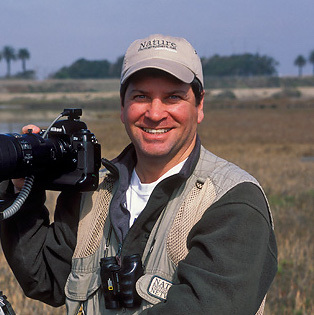 Kenn Kaufman is an expert birder and naturalist, a talented artist and photographer, a world traveler, and the author of many books about birds and other wildlife. His column “ID Tips” appears in every issue of BirdWatching. Kenn is also a field editor for Audubon Magazine and a contributor to Birds and Blooms. 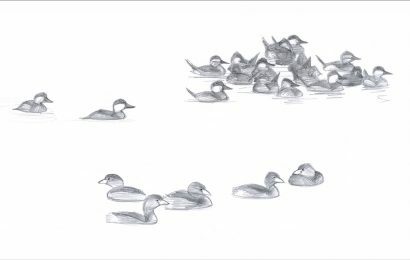 His work first appeared in Birder’s World (now BirdWatching) in April 1988. Visit his website, Kaufman Field Guides. Brian Small is a Los Angeles-based bird and nature photographer whose photos appear in the “ID Tips” column in every issue of BirdWatching. 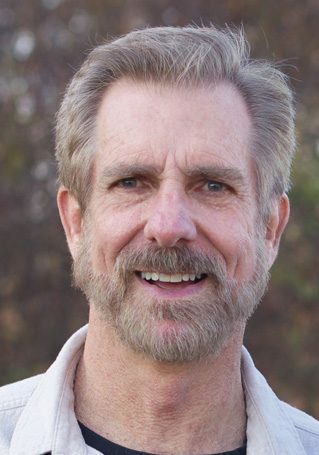 His work has been published in Time, The New York Times, Audubon, Nature Conservancy, National Wildlife, Wildlife Conservation, and many other publications. His photos also illustrate many field guides, including Kenn Kaufman’s Birds of North America, a series of state bird identification guides published with the American Birding Association, and his own Eastern and Western photographic field guides to the birds of North America published in 2009 with author Paul Sterry and Princeton University Press.